the head on my model t that i just got running is cracked. 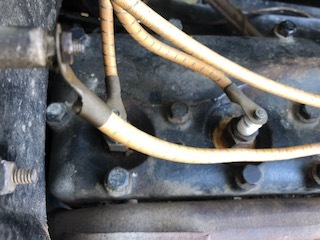 it barely leaks anything out but enough to fill up the area around the spark plug next to it. what is the best option? grind it down some and apply jb weld? replace with a stock head? or replace with a high compression z head? Unless it's progressed as far as it can go, the crack will eventually lengthen unless welded or stitched. You might as well replace it. I'm sure that you can find a good original. Fix it once and be done with it. Replace the head. Stock heads are cheap. If you want to go high compression, look at Prus heads. I'm running two of them and like the quality and performance. If the head's coming off do a dry/wet compression test first. It'll tell you plenty about the engines condition. If you need valve work it's a sterling opportunity. If you want to run or drive while you are looking, drill a small hole (like 1/16") at each end of the crack to keep it from spreading, clean and give it a little V along the crack and repair with JB Weld. If you remove the plug(s) put something in the holes to keep the chips out. Or run as is and add water as needed. RE:If the head's coming off do a dry/wet compression test first. Good idea. If your going to replace the head I would clean out the water passageways in the block. You can carefully use a 1/4" drill to clean out the small holes in the block. You will be surprised how stopped up they can be along with the larger passageways. Also using an epoxy weld like JB Weld can repair the crack in the head indefinitely if you stop the crack from crawling by drilling a small hole on each end of it. T heads are still fairly plentiful but I wouldn't throw it away just yet if you do replace it! A different product to seal and stop a coolant leak at the head if you choose to do that is Ultra Black adhesive by Permatex which you should already have for lots of repair uses. It's flexible so will adhere without cracking. Think "Flex Seal" as seen on TV. It's be a good time for a Z or Prus head. I have plenty of stock high heads ready to go. $125.00 plus shipping. hankpattylee@bellsouth.net. 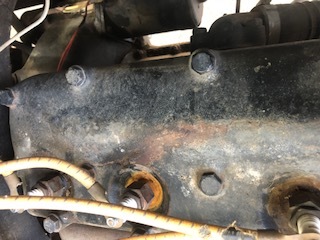 What risks are associated with doing a high compression head on an old motor I know nothing about? I just got the car last week and got it running for the first time in 60 years. At this point not knowing the bottom end I would stick with stock. The biggest risk is NOT knowing the condition of the crank, rods or babbitt. I ran into the same thing and posted on the classifieds here for a replacement head. Several guys within an easy drive of me offered stock heads for free, or around $50. Drilling holes at either end of the crack is called "stop drilling". It is widely used on aircraft (non-pressurized) skins. There is one element of stop drilling that is absolutely critical - the small stop hole must be at exactly the end of the crack. If the crack extends .001" beyond the stop drill hole, the crack will continue to spread. Eric, If you go to the classifieds and find the ad that is "FOR SALE HIGH HEADS" Dave Huson is selling heads for $.02 if you buy something else and if you are just getting started I am sure you need something else. Dave is a great guy to deal with and a great resource for parts. Eric I sent you a PM. I understand you can get a reasonable boost in compression/power by having the head skimmed a bit ... without purchasing an engineered compression head? Using an earlier "Low head" on the later T engines was a trick to raise the compression and presumably raise the HP. Taking .100 off the head is suppose to help also. The older T's had around 22hp and when Ford started using the high head in abt 1919? The hp dropped to 20. Or about that anyway. Some posters have said they used one of the newer higher compression heads and didn't notice a real difference. Others have said it helps when pulling hills. I never tried anything other than shaving an original head or using the older high head on my 21. That seemed to help some but not a whole lot. Maybe it was wishful thinking?